Tuesday December 19 1911 Busy with Christmas work down town in the morning buying presents Cora & Rob out for supper and spent the evening. They go to Des Moines tomorrow and on to the west. Wednesday December 20 1911 A bad day with rain and sleet. Rob & Cora went in the afternoon. I wrote letters and did up packages to send away. Thursday December 21 1911 Will in town all day to a road [illegible]. I did some washing and busy with some things I want to finish. Weather better. Friday December 22 1911 I went down to spend the day with the girls. Came up town on my way home. Did evening work and was busy ironing all evening. 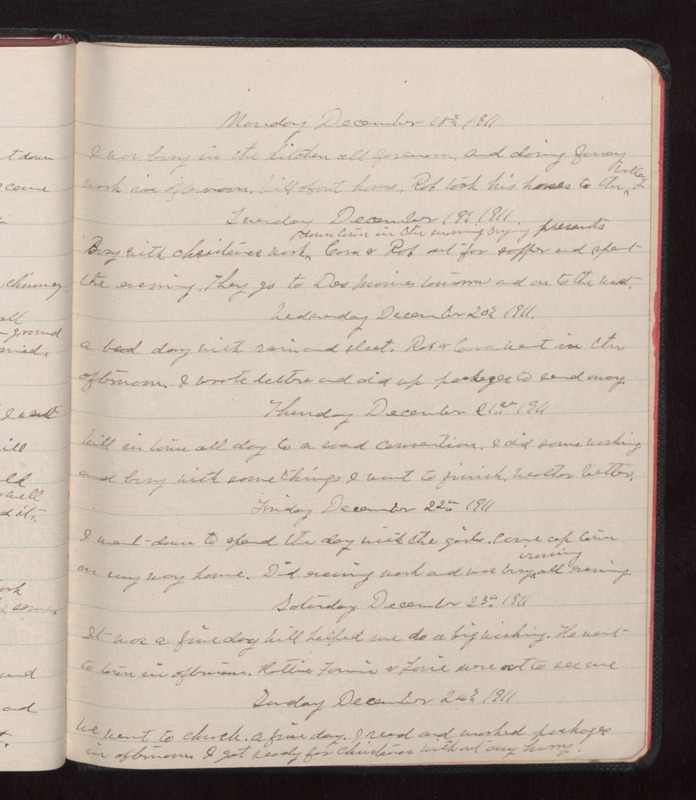 Saturday December 23 1911 It was a fine day Will helped me do a big washing. We went to town in afternoon. Hattie Fannie & [Lorie?] were out to see me Sunday December 24 1911 We went to church. a fine day. I read and worked packages in afternoon. I got ready for Christmas without any hurry.